Now almost 20 years old, the digital turn in architecture has already gone through several stages and phases. Architectural Design (AD) has captured them all – from folding to cyberspace, nonlinearity and hypersurfaces, from versioning to scripting, emergence, information modelling and parametricism. It has recorded and interpreted the spirit of the times with vivid documentary precision, fostering and often anticipating crucial architectural and theoretical developments. This anthology of AD’s most salient articles is chronologically and thematically arranged to provide a complete historical timeline of the recent rise to pre-eminence of computer-based design and production. Mario Carpo provides an astute overview of the recent history of digital design in his comprehensive introductory essay and in his leaders to each original text. A much needed pedagogical and research tool for students and scholars, this synopsis also relates the present state of digitality in architecture to the history and theory of its recent development and trends, and raises issues of crucial importance for the contemporary practice of the design professions. 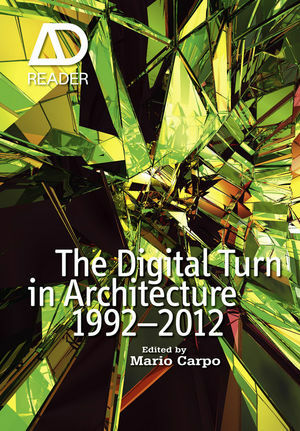 A comprehensive anthology on digital architecture edited by one of its most eminent scholars in this field, Mario Carpo. Includes seminal texts by Bernard Cache, Peter Eisenman, John Frazer, Charles Jencks, Greg Lynn, Achim Menges and Patrik Schumacher. Features key works by FOA, Frank Gehry, Zaha Hadid, Ali Rahim, Lars Spuybroek/NOX, Kas Oosterhuis and SHoP. Mario Carpo teaches architectural history and theory at the School of Architecture of Paris-La Villette, at the Georgia Institute of Technology and at the Yale School of Architecture. His research and publications focus on the relationship between architectural theory, cultural history and the history of information technology. Among his publications are the award-winning Architecture in the Age of Printing (2001), monographs on Sebastiano Serlio and Leon Battista Alberti, and The Alphabet and the Algorithm (2011), a history and critique of digital design theory. Carpo’s writings are also published internationally in journals and architectural magazines.